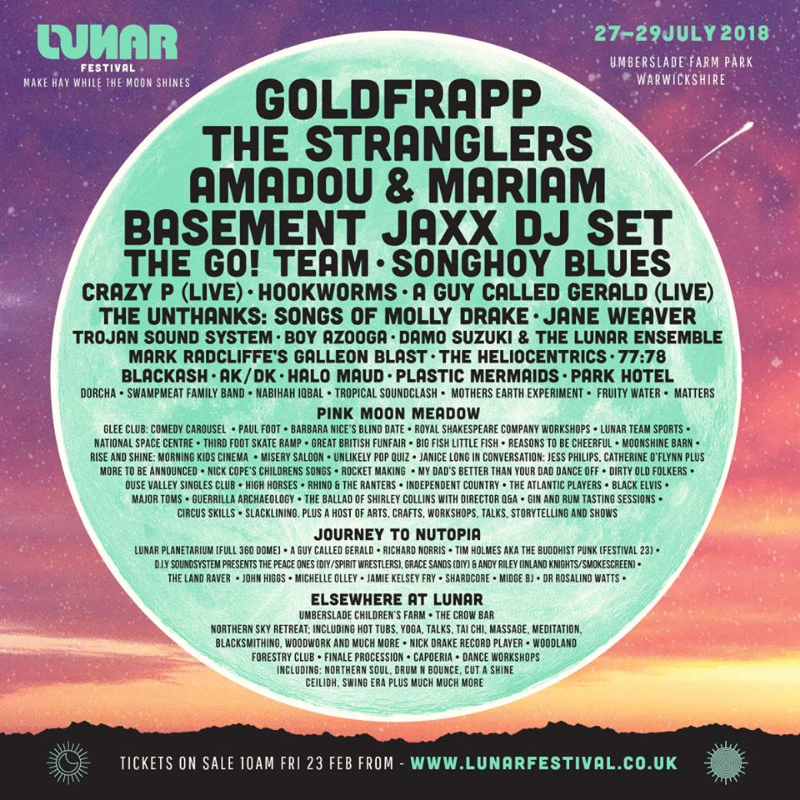 The 2018 line-up for Lunar Festival, one of the UK’s most exciting and diverse music and arts festivals, has been announced. Committed to staying small whilst thinking big, the 2018 edition of Lunar Festival welcomes the introduction of Lunar’s Seven Elements: Learn, Listen, Taste, Relax, Laugh, Move and Create – placing creativity, community and celebration at the heart of an exciting and diverse programme. Amadou & Mariam met as children at Mali’s Institute for the Young Blind in Bamako. Now celebrating 35 years as successful musicians playing their electric take on Afroblues across the globe, the duo has recorded eight full-length albums (including 2017’s “La Confusion” via Because Music) and count Stevie Wonder, Manu Chao and Simpson’s creator Matt Groening amongst their fans. Nabihah Iqbal (formerly Throwing Shade) released her debut LP on respected British label Ninja Tune in December 2017. ‘Weighing of the Heart’ melds live instrumentation and moody, propulsive basslines with shimmering synth atmospheres – a storming work realised by a musician, broadcaster (NTS Radio) and multi-disciplinary artist (Tate, ICA, Barbican). Goldfrapp’s seventh album ‘Silver Eye’ (a reference to the moon) was released in 2017 and marked a new direction towards cinematic pop with a twist – away from previous forays into electronic folk by Alison Goldfrapp and Will Gregory. Ever-inventive and transformational over 21 years of recording and performing, the duo promises a dramatic and visually striking experience to help top off the festival’s Saturday main stage offer. Critic Alex Petridis (Guardian Music) awarded Hookworms – rock band gone electronic – a rare five-star review for their February 2018 release ‘Microshift’. Lunar Festival offers genuinely memorable and intimate surroundings in which to see and hear one of the UK’s most exciting acts live. Fusing slinky underground disco, deep electronic throbs, and shimmering pop moments, Crazy P make dance music with a voice, a heart, and soul – a perfect foil for the psychedelic jazz of Soundway Records collective and perennial festival pleasers The Heliocentrics, as well as Birmingham industrial synth-doom merchants Matters. Seminal punk and new wave band The Stranglers bring the Lunar Festival weekend to a fitting end – 43 years since emerging via the Guildford punk rock scene. The band have gone on to experiment with different styles, resulting in smash hits ‘Golden Brown’, ‘No More Heroes’, ‘Peaches’ and ‘Always The Sun’, and are consistently cited as one of the most influential acts to have come out of the UK in the 20th century. In the timber-framed Moonshine Barn – a further addition to this year’s Lunar offering – comedy is provided by one of the UK’s longest-standing comedy clubs, The Glee Club. This includes their famous Comedy Carousel as well as performances by crowd favourite Paul Foot and local hero Barbara Nice, hosting Celebrity Blind Date. The Misery Saloon, strictly for the morose over 18s, will host whiskey, rum and gin tasting sessions as well as being home to a matinee of “thoroughly depressing film” and employ a strict “No Smiling Rule”.